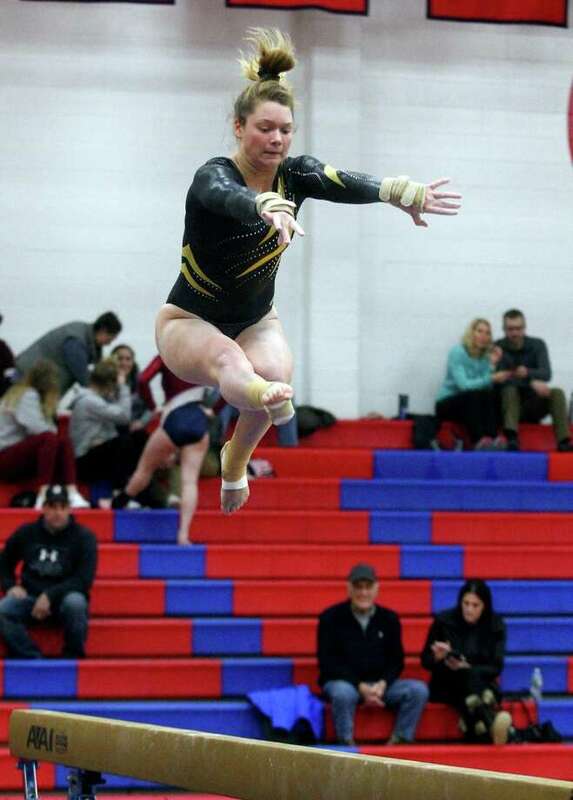 Hand's Grace Rogers competes on the balance beam during gymnastics action against Foran in Milford, Conn., on Thursday Jan. 17, 2019. (At Foran) Vault: 1. Grace Rogers (DH) and Emma Jerue (F) 8.1, 2. Grace Segnere (DH) and Brooke Kustra (B) 8.0, 3. Samantha Lambert (F) 7.9; Bars: 1. Kustra (B) 7.1, 2. Rogers (DH) 6.5, 3. Jerue (F) 6.2; Beam: 1. Rogers (DH) and Lambert (F) 8.0, 2. Jerue (F) 7.7, 3. Catherine Aranow (DH) 7.4; Floor: 1. Rogers (DH) 8.4, 2. Kelley Levis (DH) 7.9, 3. Britney Lynch (F) 7.2; All Around: 1. Rogers (DH) 31.0, 2. Jerue (F) 29.1, 3. Kustra (B) 28.5. Records: Hand 0-6.